Hello, February! In amongst the long Sunny days and balmy nights, there’s been a few things that have crossed my radar of late. So grab a coffee and settle in! I’ve noticed a lot of conflicting information circulating in Facebook groups recently surrounding the new Cellnovo insulin pump being withdrawn from the Australian market, with suggestions that the parafin wax was unable to withstand the Australian Summer heat. With no official communication from either Cellnovo or the NDSS, I can only assume that the product has not actually been recalled, but rather just that new Cellnovo units are no longer for sale. I have since learned that an upgraded Cellnovo system is expected in the next month, which will be swapped out with all existing Cellnovo units before becoming available to new customers on the waiting list. Speaking of pump choice, there’s been a lot of speculation about AMSL Diabetes acquiring a new pump to distribute following the demise of Animas. While Tandem’s t-slim touch screen insulin pump with Dexcom integration would feel like a natural successor for AMSL, it is not currently listed on the Australian Register of Therapeutic Goods (ARTG) and cannot be lawfully be distributed in Australia. Given that approval can take a number of years, I’d be inclined to say that it’s unlikely at this stage. The Oz Diabetes Online Community lives on! David @davidburren can be found hanging out under the #OzDOC hashtag on Twitter every Tuesday night from 8.30 to 9.30pm for anyone in the community seeking out peer support in the slot recently vacated by moderator Kim. There’s also a new Twitter account @OzDOC_host, where weekly chats are being run from. Here in Australia, it’s a given that most of us wouldn’t think too hard about the cost of our insulin thanks to generous government subsidies. What you might not be aware of, however, is that the full cost of a script of insulin is several hundred dollars. In other parts of the world, this insulin is far less accessible and a lot less affordable. February marks the annual Spare a Rose campaign in the diabetes community. The idea is to spare a rose on Valentine’s Day, and donate the cost of that rose (roughly $6 AUD) to a child with diabetes in need of insulin. Sparing just one rose will provide a child with life for a month in the form of insulin. You can find out more and donate at sparearose.org. Finally, the Young Adult Diabetes Committee here in Perth are hosting their first event for the year on Thursday February 22. 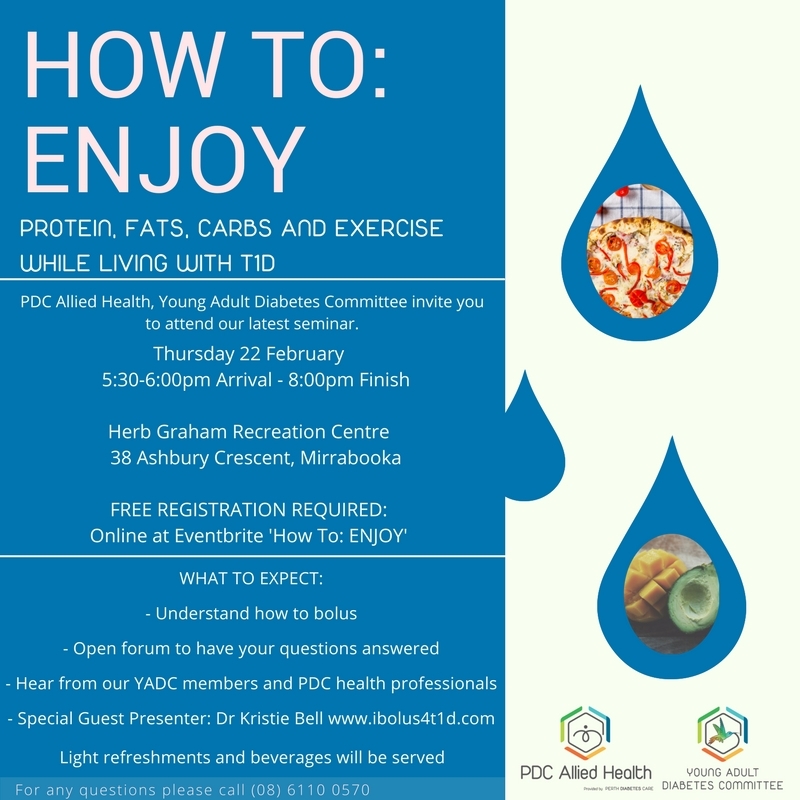 Dr Kirstie Bell will be sharing some insights from her research into fat and protein’s effect on blood glucose levels (you can read more about Dr Bell’s research here). If you live in Perth or you know of anyone who does, please pass this on. You do need to register through Eventbrite, however. After starting my work week on Sunday this week, I’m fuelling myself purely on caffeine and on the countdown to a three and a half day weekend. Happy hump day! I always enjoy reading about places I want to visit. Thank you Frank ! !